Private Ronald William Dell, 6096656, 4th Battalion, The Buffs (Royal East Kent Regiment). 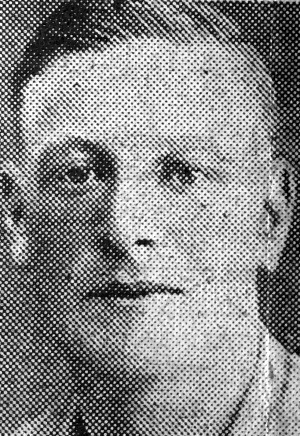 Ronald William Dell was born in Ossett on 8th April 1915, the second son of Herbert Dell and Florence Maud Dell (nee Green), of Ossett, Yorkshire, who married at South Ossett Christ Church on the 17th April 1910. Ronald had an elder brother Wilfred Dell, born in 1911, and a younger brother, Herbert Trevor Dell, born on the 25th May 1926. In 1911 Ossett born Herbert and Florence Maud, born at Lingwell Gate, were living at 3, Stafford Buildings, Ossett. Herbert was a 27 year-old woollen mule spinner and Florence was aged 22 years. By 1939, the couple had moved to 12, Wycliffe Street, Ossett, where they were living with two of their three sons including Ronald William who was working as a basket maker. The youngest son, Herbert Trevor aged 13 years was still at school and the boys’ father, Herbert, was a woollen spinner. At around midnight, HMS 'Eclipse', the destroyer carrying 'A' company and part of the HQ company, struck a mine, laid in 48 fathoms, between Kos and Kalymnos. The mine exploded under her forward boiler room, setting the fuel tanks ablaze. She immediately took on a heavy list and broke in two, spilling burning fuel into the sea. Within three minutes she sank. "I was standing on deck with my best friend Jack (Hawkes) and the other boys....and that was it, I didn't know any more....I woke up and all I saw was flames in my eyes and everything was still. My legs were caught in the wires going round the boat....my back was towards the edge of the destroyer and as she turned I went down with her. Strangely, it felt kind of peaceful....then, I don't know if I kicked or what, but I came to the surface....about 100 yards from the destroyer. I saw her turn over and the screws were still going fast as she went down....speeding down." "Private Ronald Dell, Ossett - On Friday last, Mr. and Mrs. H. Dell, 12, Wycliffe Street, Ossett, received information that their second son, Private Ronald William Dell (28), was missing as from 23rd-24th October, at sea in the Middle East. Born in Ossett, he was educated at Southdale Council School, and afterwards employed by Mr. J. Burdekin, basket works, Flushdyke, Ossett. He joined the Army in May 1940 and went to Malta in October the same year, where he had been practically ever since. A single man, he was a member of the Borough Band and the Trades and Labour Club." Above: Destroyer HMS 'Eclipse' which sunk after hitting a mine on the 23rd October 1943. 2. "Ossett Observer", 13th November 1943.